There’s Not Much Left sees Todd Anderson-Kunert establish an immersive, multidisciplinary project that explores the emotional space of the domestic environment, and our psychological interactions within. Within this space of psychological exploration, Anderson-Kunert charts the melancholy associated with traces left by other people, and examines how these traces continue to leave a mark long after the other has vacated physical space. Todd Anderson- Kunert uses a combination of photography, sound and installation in his art practice to communicate the complex emotions and actions of human beings in ways in which words often fall short. He simultaneously uses these mediums as vehicles to research the relationship between sound and vision, and their corresponding psychological and emotional implications. Part of this research is how affectively the combined use of sound and image assist in communicating his ideas, and also how they manipulate audience psychology. Influenced by his interest in film studies, philosophy, and in particular epistemology, his specific fascination lies in the actions and interactions of humans, and how our internal thoughts and feelings can manifest themselves physically through our actions. The beauty of Todd’s work is in its simplicity and its ability to communicate powerfully. His images illustrate shared experiences and emotions, portraying them with common gestures in everyday situations. In There’s not much left we see a young man, immersed in the sensory experience of smelling a silk scarf. Eyes closed, face engulfed, on bended knee, feet in contact with the beige carpet in an otherwise empty room. There is a sense of desperation, obsession and desire actioned in his pose, which is reinforced by the explanatory title. We can imagine the softness of the cloth, the smell of perfume, the scent of a lover. We can’t help but share in the subject’s pain as most of us can recall a time when we too experienced the loss of a lover. After a break up, a death, in a desperate attempt to have them back, to remember what it was like, to be close. The action is at once comforting and cruel. In There’s not much left we see a close up of the same carpet, ever so slightly stained, a signifier of what once was. This stain implies a history of shared experiences, of shared bodily fluids, a constant reminder of what is lost, but also the experience of pure bliss. Therein is the sadistic pleasure of having felt so deeply, having experienced that much love only to lose it all. However, all is not lost! Most of us would always choose to feel deeply, to love and lose, rather than to never love at all. These sympathetic emotions are punctured, interrupted by the unusual placement of the images; on the floor, leaning against a wall. 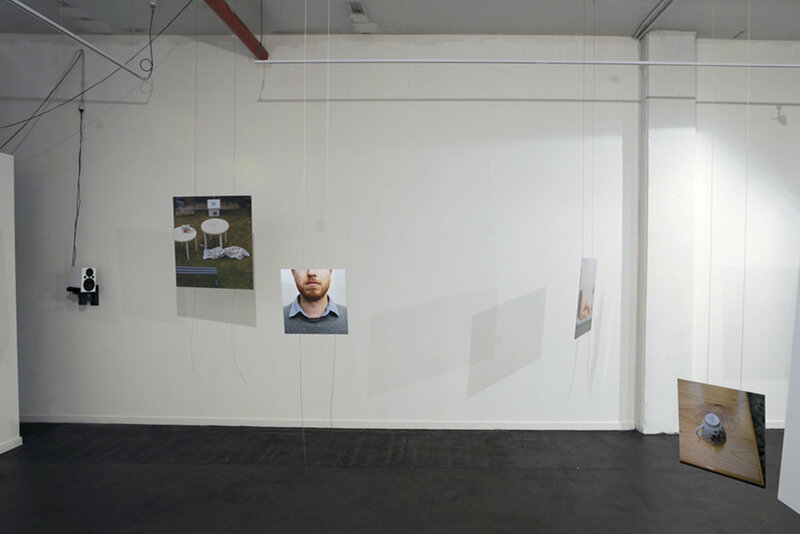 The installation draws our attention to the construction of photography; we become aware of the photographs failed attempt at mimicking reality. The perceptible soundtrack reflects the emotional duality of pain and pleasure found in the imagery. An unnerving buzz, a high pitched frequency penetrates the air, initially making us feel uncomfortable, but in time has a lulling, calming effect. The soundtrack has a way of keeping us in the present moment, in the actual viewing experience, however, repeatedly reliving a past moment expressed in the imagery, which ultimately leaves us with a sense of melancholy.